Wanna' know what the most discussed issues are on Facebook? 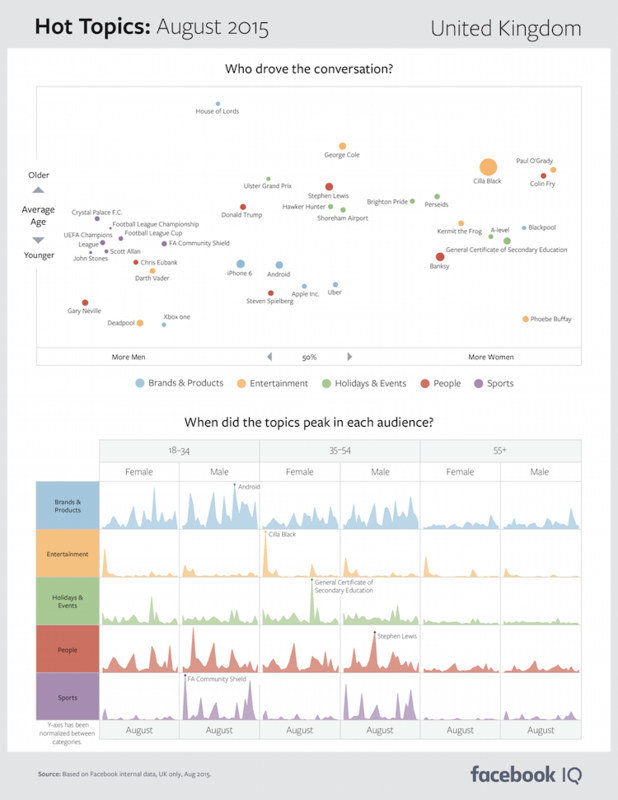 Each month, Facebook produces a series of regional reports on the hot issues, including what the top issues were, which demographic groups were the most active in the related discussion, and even when each specific discussion peaked, during the month. The reports offer great insight into Facebook's audience, and the issues that matter most to each age and gender subset within it. So what was the big issue for August? Donald Trump. While the conversation skewed towards older men, that big, orange dot in the middle of the top chart shows that Trump was more discussed on Facebook than any other issue, by a big margin, in August. Whether you love him or hate him, you can't deny 'The Donald's ability to get attention. Other notable stories from August were Kanye West's announcement of his 2020 Presidential run, the Ashley Madison hack (discussed more by women than men), the trailer for the upcoming comic book film Deadpool was popular amongst younger male audiences, while the passing of NFL great Frank Gifford was also highly discussed. "Each an example of an effective personal brand, West and Trump know how to create and maintain buzz. They understand that their audiences value authenticity above all. Each man is a lesson in creating a uniquely confident voice, a signal to marketers that taking a stand or creating controversy can be advantageous-so long as you know what you stand for and how to stay true to your brand." It's definitely a valid point - I've written before about the capacity for controversy to build a brand, if you can risk the potential fallout. While both West and Trump give fuel to their haters through their speeches and actions, they always inspire conversation and discussion, keeping a hold on public attention - as evidenced by their share of discussion on the world's largest social network. Providing regional insight into the conversations that are resonating with the global Facebook audience. The Hot Topics reports are a great read, and are worth checking out to get a sense of what's being discussed amongst your target audiences and demographic groups - while the data can only be provided in retrospect, it can still provide context on what's popular among your audience which can help fuel your content and advertising efforts on the platform, ensuring you're part of the conversations most relevant to your brand. 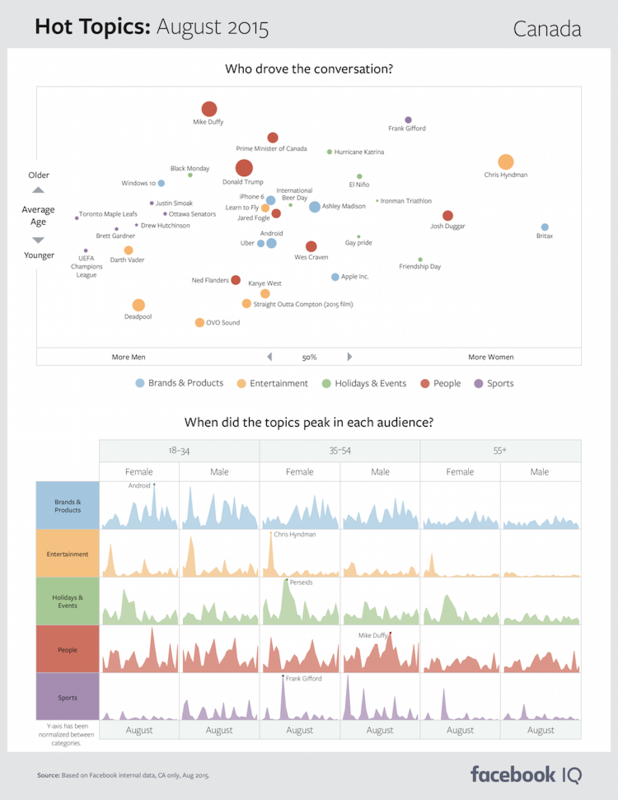 In addition, Facebook also provides a listing of some of the best performing video content, by industry, to help brands better understand what's resonating with audiences. This month's "Video Ad Creative Spotlight" includes content from Glade, Dairy Queen and Beats by Dre. If you're trying to think of an angle or concept for your Facebook video campaign, these might spark some ideas to help boost your brand. 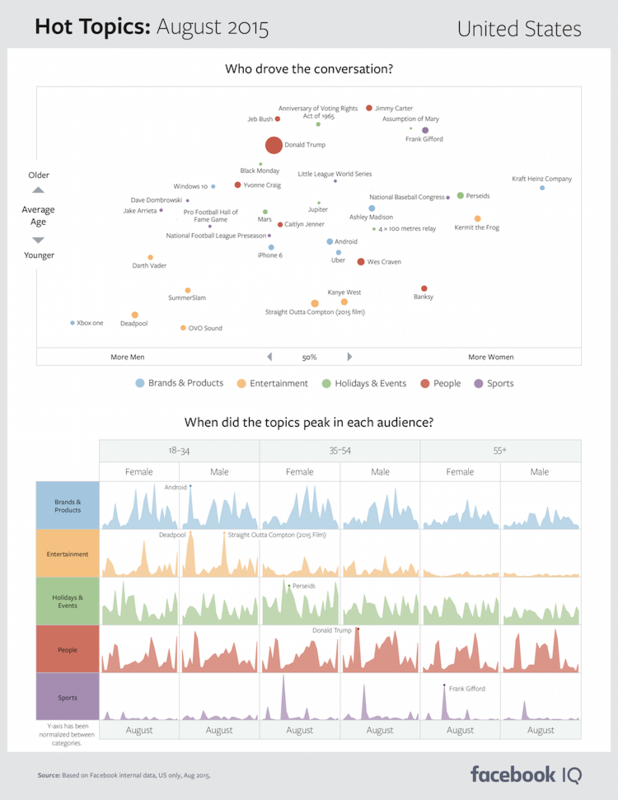 Facebook's Hot Topics reports for August are available here.